BROWNSBURG, Ind. – Welcome to Day 2 at the #USNats! 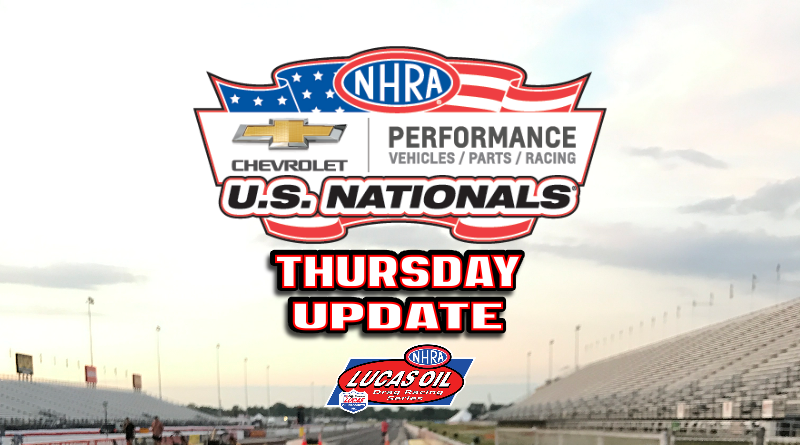 Thursday’s action featured sportsman qualifying, time trials, class eliminations, and first round of eliminations for Super Comp. As we mentioned in our Day 1 coverage, the Super Stockers and Stockers were flying at Indy. Not much changed today as they continued their onslaught. Paul Wong retained his spot at the top of the Stock Eliminator charts. I mentioned yesterday that Wong ran almost 2 seconds under his index and today he did just that, Wong’s 13.485 from his ’87 El Camino was -2.015 under the V/SA index. That my friends is an impressive effort! Bill Dyer, Port Byron, Ill., qualified a distant second in his FS/K ’10 Mustang with a -1.731 under pass. Gary Summers, Franklin, Ky., was a close third with a -1.698 under pass in his U/SA ’75 Mustang. Longview, Tex. resident Bill Bagley anchored the 128-car field with a -.889 under effort in his ’73 Duster. The No. 129 qualifier, Nic Williams from England, was also -.889 under in his ’69 Camaro but lost a spot in the field due to a tie-breaker. Other notable Stock Eliminator racers that are on the outside looking in include the Stock finalist from the last two national events Randi Lyn Shipp along with Division 1 hitter Anthony Fetch. Several racers outside the top 128 could easily make the field as there are normally several cars that fail tear-down allowing alternates to sneak into eliminations. With qualifying and class eliminations complete, the Stockers will have the day off on Friday before eliminations start on Saturday morning. On the Super Stock side, Ernie Neal retained his top spot through three rounds of qualifying. Neal’s Columbus, Ind. based GT/N ’05 Cavalier laid down an impressive 9.553, -1.497 under the index. Dan Jacobs, also driving a ’05 Cavalier, is second on the charts with a -1.432 under pass. Bucky Hess anchored the 128-car field with a -.657, 8.643 pass from his Bunker Hill, W.V. based ’64 HEMI® Barracuda. Notable non-qualifiers in Super Stock include John Calvert, J. Allen Sherman, Michael Volkman, and Pete D’Agnolo. Super Stockers are now gearing up for class eliminations on Friday. After round 3 of HEMI® Challenge qualifying, Gary Wolkwitz, Whitehouse Station, N.J., drove to the top spot on Thursday with a 8.524 at 154.86 pass. Wolkwitz eclipsed the 8.538 of second place qualifier and 2-time event champion James Daniels. Steve Comella, the No. 1 qualifier on Wednesday, holds down the 3-spot with a 8.556. On the bump for the 16-car field is Steve Kent. The Louisiana based racer claimed the final spot with a 8.815 effort from his ‘Cuda. The HEMI® Challenge field will run eliminations on Friday culminating with the final round in prime time, running just prior to the Friday night Pro qualifying session. Super Gas competitors had a relaxed day with only time trials scheduled today but business will pick up tomorrow as they have several rounds of eliminations on tap. Super Comp, on the other hand, was the first class to see final eliminations begin as round 1 was completed this afternoon. While a large number of top name racers made it through to the second round, a number of top names fell in round 1 including Heidi Robison, Koy Collier (lost to Joe Hessling of APD in a 8.904 to 8.905 race decided by .001, they both had .022 lights), Jeremy Mason (last week’s Super Gas winner at Beech Bend), Dan Fletcher, Jason Kenny, Jackson Collier, Austin McClure (Top 5 nationally), Austin Richardson, Jacob Elrod, Mia Tedesco, and Aaron Stanfield. Racer’s still in the running for the Super Comp Wally include Mike Robilotto, Craig “Bighead” Anderson, Gary Stinnett, Val Torres Jr., Tommy Phillips, Ray Miller 3, Ray Miller 2, Luke Bogacki, “Racin” Jason Lynch, Steve Collier, Alan Kenny, Michelle Furr, Devin Isenhower, Chris Dodd, “The King” Edmond Richardson, and last week’s Super Stock winner at Beech Bend, Tyler Bohannon. As far as my Super Comp picks go, I’m 4 for 5 after round 1. I lost Austin McClure in round 1 but I still have “The King”, Chris Dodd, Devin Isenhower, and Val Torres Jr. going into second round. There’s a lot of racing left but I’m looking good so far. Check back tomorrow as we’ll have results from Friday’s action at the #USNats.